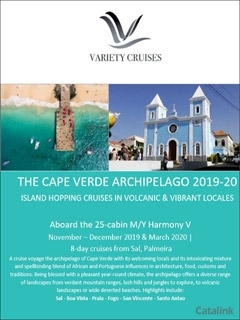 To order a printed copy of the Cape Verde Cruises brochure, simply click the Request button below. The year-round sun and diverse landscapes make for the perfect retreat destination.. mountain ranges, lush hills and jungles are just some of the things you'll uncover along the way. A cruise in Cape Verde offers the chance to explore exceptional sights like the UNESCO listed Cidade Velha- the first colonial city built in the tropics, you'll also get the chance to see the imposing sight of Fogo Volcano... it's quite a sight! If you are looking to relax then you'll love the beaches of Boavista, the nearby villages boast delightful restaurants and beautiful architecture. On board you can expect premium cabins and delicious cuisine, the sundeck is the perfect place to soak up some sun and enjoy the views! Request the Cape Verde - Cruises Brochure today for inspiration on the trip of your lifetime! By pressing the Request Printed Brochure button you give consent to Cape Verde Cruises (and their Data Processors for the specific purpose of delivering your literature) to send you their Brochure .